Goals have been hard to come by for most teams at the World Cup, but not for Belgium. The Red Devils added another blowout win to their tournament resumé today by plastering Tunisia by a score of 5-2. Once again the Belgian goalfest was led by their two star forwards, Eden Hazard and Romelu Lukaku, both of whom have been beasting on their opponents all tournament long. Belgium got a fifth goal from Michy Batshuayi before the game was over, and Tunisia scored a consolation goal late in stoppage time to give the match its final margin. Belgium looked fearsome all day, blowing right through Tunisia en route to creating good chances almost whenever they got on the ball. It was one of the most impressive performances we’ve seen so far this summer. Today’s result gives the Red Devils eight goals scored in two games played, which ties them with Russia (hmmmmmmmmmm) for the most in the tournament. 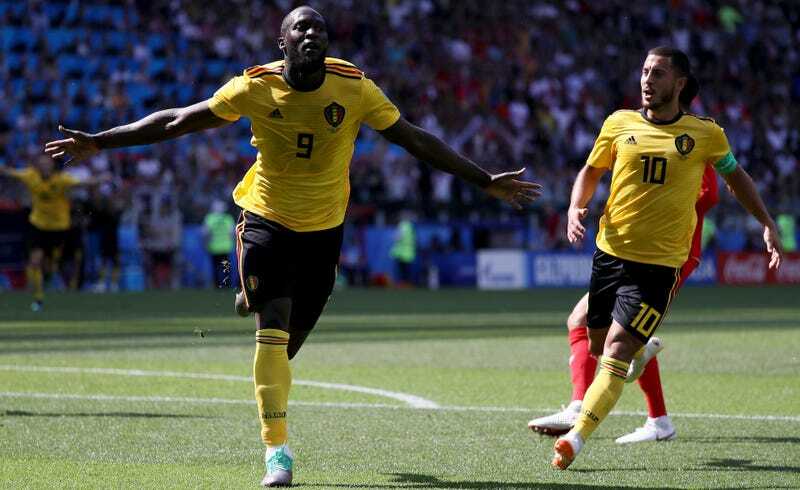 It was also Lukaku’s second brace in as many games, which ties him with Cristiano Ronaldo as the World Cup’s highest scoring player. The entire team is on fire right now. It shouldn’t really be a surprise how dangerous Belgium have looked. The quality of their attacking players is as good as anyone else’s in the field. To be able to put out a lineup that includes Hazard, Lukaku, Kevin De Bruyne, Dries Mertens, and Yannick Carrasco, and have that team maintain a semblance of balance, is ridiculous. Even the best club teams would envy a squad like that. We shouldn’t lose sight of who Belgium have put these eight goals past. Neither Panama or Tunisia are very good, and the latter played in just about the stupidest way possible today by trying to play a risky possession game and in result gifting Belgium countless dangerous counterattacking opportunities. Belgium’s opponents in the knockout rounds won’t be so generous with the easy chances, and it’s unclear if the attacker-heavy lineups they’ve featured so far this tournament will be able to stand up against teams with enough firepower of their own to punish Belgium’s relatively weak midfield and defense. But more important than how Belgium will fare in the latter stages of the World Cup is the fact that Belgium will be in the latter stages of the World Cup. This team has already made good on the promise their star-studded attack portended coming into the tournament, and they have no reason to feel inferior to any other team they’ll face. Eight goals are eight goals, even if they were scored against overmatched opposition. When so many of the other favorites are struggling to create enough chances to win, Belgium setting up and knocking in scoring opportunities at will should give them confidence that they can run up the score on anybody. After all, Hazard and Lukaku are balling right now, and they’re not going anywhere.